Two months after losing his Chatime franchise, Loob Holding CEO Bryan Loo started his own brand, Tealive, which opened its first international outlet in Vietnam recently. Moving at lightning speed, the company plans to expand to 15 countries in the next three years. Loob Holding Sdn Bhd endured a trial by fire when it lost the Chatime franchise early this year and came out with its own brand in less than three months. Having placed the new brand, Tealive, on a firm footing, CEO Bryan Loo is not letting the grass grow under his feet. Even before Tealive celebrates its first birthday, Loob has already opened its first overseas branch in Vietnam. Loo says the company spent about six months establishing the business during the transition from Chatime (our ex-brand, as he calls it) to Tealive. Firstly, it had to reassure its 1,000-plus staff that nobody would be laid off. Although the company rationalised its business and closed down eight non-performing outlets (he maintains that it was the malls they were situated in that were the real underperformers), it managed to redeploy the workers to the 10 other food and beverage (F&B) businesses in Loob’s stable. Then, it familiarised its two million customers with the new brand. And after the pain of transition came the sweet realisation that for the first time, it actually owns the brand and there will be, literally, no holds barred. “Our new brand was born of very difficult circumstances, but it was born with a mission and purpose,” says Loo. Why Vietnam? “We were looking for a market with a huge population in Southeast Asia. There are only three such markets — Indonesia, the Philippines and Vietnam. Indonesia has about 250 million people while Vietnam and the Philippines have about 100 million each,” he says. How is this possible? “Vietnam has a high disposable income. People can argue that the Vietnamese have lower salaries compared with Malaysians, but when you compare apple with apple, a Malaysian earning RM2,000 to RM2,500 has to pay for his house and car loans, leaving only RM300 to RM400 to spend every month. Loob is looking to open 10 stores in Australia next year and 40 by 2020. Only the first seven will be directly owned and operated; the rest will be franchised out. It also plans to open outlets in Thailand by the second quarter of next year. “We are using different strategies for different markets. In Vietnam and Australia, we will own and operate the stores. In Thailand, we will have a full franchising model. 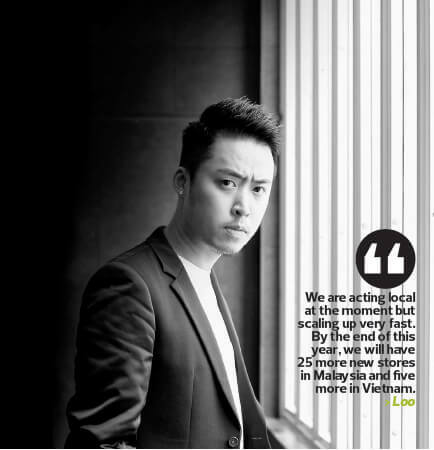 That means we will pick the markets that we want to go through the learning curve ourselves,” says Loo. In addition, it is coming up with a “digitally smart menu”. “We’re going to re-engineer the whole customer experience and call it Tealive Customer Experience 2.0. We are building a global integrated loyalty and reward programme so that anyone with a Tealive Unity Card can go to any of our stores around the world and find great deals. It will be like airmiles, where one is rewarded for travelling overseas and visiting certain stores,” he says. The centre will also be developing new products to capitalise on the shift in health trends. “We will introduce things like a nutrient booster, which you can add to your drinks. We will have a collagen booster, probiotic booster, antioxidant booster ... we are taking a lot of initiatives to change people’s perception that bubble tea is an unhealthy drink,” says Loo. He says one of Loob’s biggest “motivations” to venture abroad is the dismal state of the domestic market. “Rents are rising, the currency is going down and the cost of raw materials is going up ... we want to grow the local market, but the situation is not encouraging at all. It becomes a motivation for us to go abroad. We will continue to strengthen our local market, but half our effort will be on getting into other markets. Basically, Loob is looking to bring Tealive to 15 markets over the next three years. “We had to come up with a goal that scares us. Otherwise, we might as well not do it. We have to be realistic but at the same time, ambitious. And we want to make sure that for each country, we have the right partner,” Loo says. Retail is a cash business, so the company can grow with internally generated funds. “We do cash calls in a very controlled manner. We like to keep our debt small, so our gearing is very low,” says Loo, adding that at the same time, the company wants to grow as quickly as possible. The ultimate goal of its 1,000-day expansion plan, presented at its headquarters in Kota Damansara earlier this year, is to list the business by 2020. “With 1,000 locations worldwide or a total group revenue of over RM1 billion. That’s the goal,” he says. Where? “We cannot give a definite answer right now. But we are looking at a listing board that allows us to realise our internationalisation plans. We want to attract foreign investors. We are not discounting Malaysia but we want to broaden our options,” says Loo. One thing all this rapid growth will do is give the company leverage when dealing with its suppliers. “We want to develop a network of stores worldwide so that we can put our supply chain in the picture. We can literally give the company huge bargaining power when it comes to the supply chain. So the economies of scale will only grow over time with our local and international expansion,” Loo says. This is also a very testing time for the company’s talent. Loo demands that they be willing to undergo the baptism by fire, that is the rapid expansion. “The company has a strong mandate to shift the leaders to have a global mindset. I don’t want to be the only one with an international exposure. I want to ensure that every one within the company has the opportunity to transform. One strength he is keen to expound on is the close management links in the company. “We have an unbreakable management link. I established the company in 2010 and there were a lot of family and friends involved. My sister is the current chief operating officer and a lot of my childhood friends are in key positions. That makes the company unbreakable because of the relationships between the key management people. That is something unique to us and it is something that can ensure our continued success for a very long time,” says Loo. The rapid expansion will also increase the barriers to entry in the industry. “I always say that F&B is the easiest market to enter because it has the lowest barriers. Everyone who has a little money will want to go into F&B. But it’s also the easiest market to get liquidated.